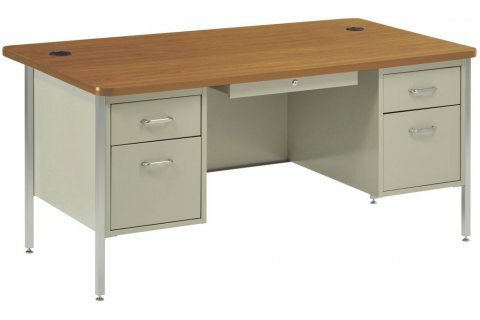 Our new line of Rounded-Corner Teacher Desks represent the traditional steel teacher's desk, updated for modern style and convenience. 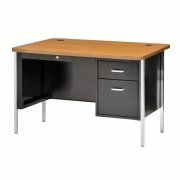 Heavy-duty, steel construction means that this desk will continue to be a classroom staple year after year. Even when yesterday's kindergarten class has graduated high school, this dependable teacher's desk will be providing years of service to the classroom. 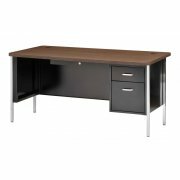 The desktop feature a convenient 6" rear overhang so that students have leg room when having a private conference with the teacher. These models are made with a tough, scratch-resistant laminate top. Rounded edges for safety complement the design. 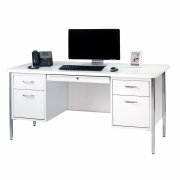 Depending on your needs, these teacher's desks are available with a variety of drawer set-ups.